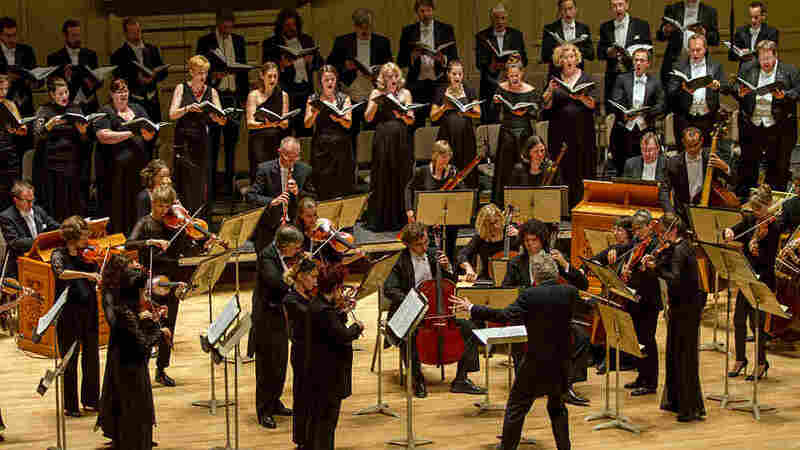 A Bicentennial For Boston's Handel And Haydn Society : Deceptive Cadence The group gave the first U.S. performance of Handel's Messiah, and still plays it today. Yet the ensemble has constantly evolved. Boston's Handel and Haydn Society is one of the oldest continuously running performing arts organizations in the country. To celebrate its bicentennial this season, the group made a new recording of a holiday perennial, Handel's Messiah, which also happens to be one of the first works it staged nearly 200 years ago. Still, the Handel and Haydn Society is very different from what it was when it started. Today it's all about historically informed performance, or H.I.P. for short. The goal is to take audiences back in time so they can experience what music might have sounded like in the Baroque and Classical periods — roughly 1600 to 1830. But the ensemble's executive director, Marie-Hélène Bernard, says the European musicians who founded this society 200 years ago were interested in performing contemporary music. 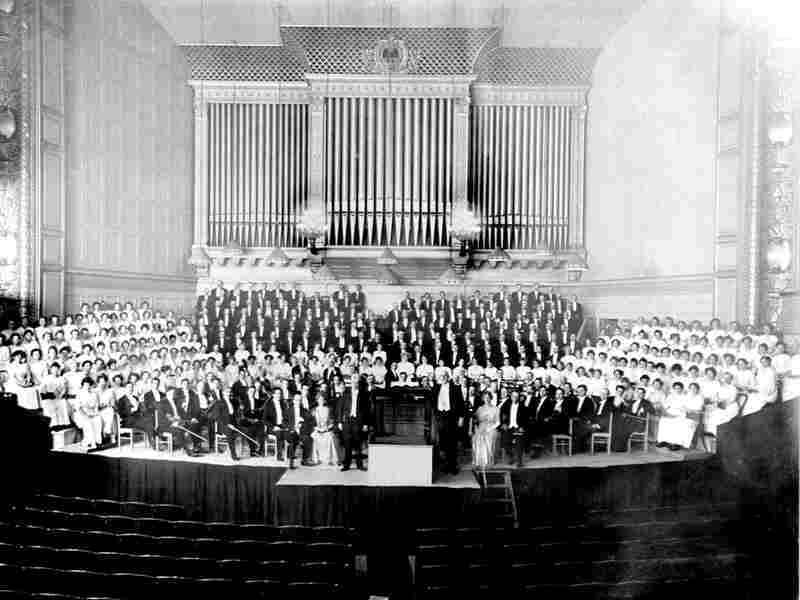 The Handel and Haydn Society, photographed in Boston's Symphony Hall in April 1915, a century after the group was founded. "You have to think that in 1815," Bernard says, "Haydn has been dead for about six years, his music is still very much in vogue in Europe, and these musicians really wanted to bring it to America." It took the founders almost a year to assemble their orchestra and chorus. Forty-four members signed on to a constitution in April, 1815. The society's first concert took place on the following Christmas Day at King's Chapel in Boston. The musicians performed excerpts from Handel's Messiah and Haydn's The Creation. A few years later H&H, as it's affectionately called, played the full compositions for the first time in the U.S. The Society performed many works that are now part of the regular repertoire but that were new in the day, Bernard says. H&H performed at memorial services for presidents, including John Adams, and at the Emancipation Proclamation celebration in 1863. For the first 100 years, voices dominated Handel and Haydn's aesthetic. For one performance of J.S. Bach's Saint Matthew Passion in 1871, the amateur chorus swelled to 700 singers. But in 1965 a single brutal review forced a major rethinking of the ensemble's direction. Boston Globe reviewer Michael Steinberg slammed the then H&H music director's pacing and neglect of Handel's intention. "What Steinberg knew," current Globe classical critic Jeremy Eichler says, "was that there was this whole thing out there called the early music movement, and that it was taking shape in places like New York, where conductors like Thomas Dunn were thinking about this repertoire in entirely new ways. They were trying to figure out the numbers, how many singers were involved in these performances back in the composers' own days." Thomas Dunn became H&H's music director in 1967. He embraced the historically informed performance idea by shrinking the chorus to about 30 professional singers. Dunn also reduced the size of the orchestra from about 100 musicians to 32. Another big change came in 1986 when Christopher Hogwood — an early music champion — took the director post. He had the musicians switch to period instruments, which Eichler says aligned with the H.I.P. trend to find a more authentic sound. In today's Handel & Haydn Society, Robert Nairn plays a copy of a double bass built in Vienna in 1730. "It has frets, it has 5 strings," Nairn explains. "This is technically a violone, so it's a precursor to a double bass in some ways." Modern basses have four strings and no frets. Nairn's strings are made of sheep gut. "It has," Nairn says, "a much raspier sound, but it also has a much richer — many more high harmonics to ring off." The downside to sheep gut strings is that they go out of tune constantly. Nairn also teaches at Juilliard and says he's seeing a surge of interest in period music among his students. That means there will likely be a new generation to draw from as the Handel & Haydn Society moves into its 3rd century. Eichler marvels at H&H's endurance: "It's just an organization that has lived so many lives. And when you think of them all at once you get a sense of this enormous sweep. To have been in around in 1815 when James Madison was president, and to be around today, I think the H&H society has this amazing history that does open up a really fascinating window onto the history of classical music in Boston and the history of classical music in America." The Handel & Haydn Society will be celebrating its bicentennial with performances this winter, spring and fall, capped with its 401st performance of Handel's Messiah next holiday season.